The concept of LV Screenplay is the creation of an enclosed space within the context of existing Louis Vuitton store environments to display products for the younger customer. In this space the young customer feels comfortable and is allowed to interact freely with the products on display. The interaction level between customer and product is the focus of this concept to create product accessibility and a more immediate experience with the product. 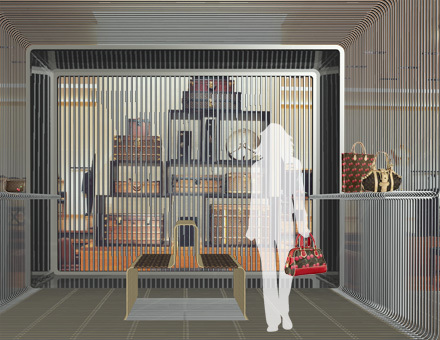 The space is a permanent display case, an accessible vitrine, hosting temporary display installations that have a more contemporary Louis Vuitton language and that can challenge the way people view Louis Vuitton merchandise. 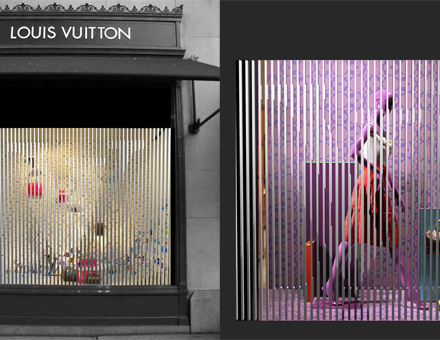 The structure provides a display area for Louis Vuitton products and an interactive kinetic mirror surface for the customer to try on and view products on themselves while moving around inside the vitrine. The motion behaviour of the mirror surface provides another level of customer to product interaction, creates visual interest and evokes curiosity. The subtle and discrete use of technology and advanced materials is part of the LV architectural approach. It does not contradict or conflict with the existing Louis Vuitton interior design language and is a logical condition for the coherence of the project. 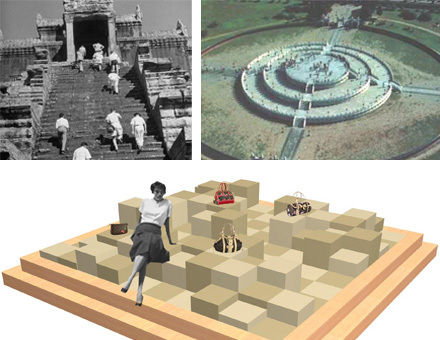 Project in collaboration with Katrin Svabo Bech and Nikiforos Maragos.